Add a special personalisation to our products such as name or initials. Contact us for Pricing on your specific requirement. PLEASE DO NOT ADD TO BASKET BEFORE OBTAINING PRICE FOR YOUR PERSONALISATION. a memorable date, a name, a short phrase or sentiment, a logo or initials. Embossing is a stylish way of making our product yours. 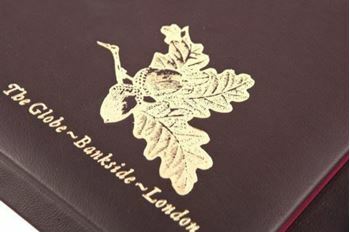 As all our products are hand made we price personalisations based on your specifc requirements. Please contact us and we'll be happy to provide a quote. Once you have the price, complete details here and add to the basket along with your chosen product.